“Thank you for gathering with us here today for this joyous occasion. We welcome all of you who have come to be participants in this marriage between Daniel and Jessica. As dear friends and family, you have helped to support their relationship from the very beginning, and by witnessing their marriage ceremony today, Daniel and Jessica ask for you to share in their future.” And so it began. Daniel and Jessica tied the knot at the beautiful Loews Sapphire Falls Resort at Universal Studios in Orlando. Lauren Gordon and Ashley Aguilar with Cherish Events took care to make sure every detail was planned to perfections. From the timelines, and vendor coordination to the table decorations and assisting to keep everything running smoothly, they did a fantastic job. Misty Miotto with Misty Miotto Photography captured every moment of the couple’s wedding day. From the bride getting ready and the first glance to the first kiss as husband and wife to their exit at the end of the evening, she captured it all. Fairbanks Florist used their creative talents to make the table decor, the wedding arch, Jessica’s bouquet and Daniel’s boutonniere look amazing. The rich vibrant colors made everything pop. Rev. 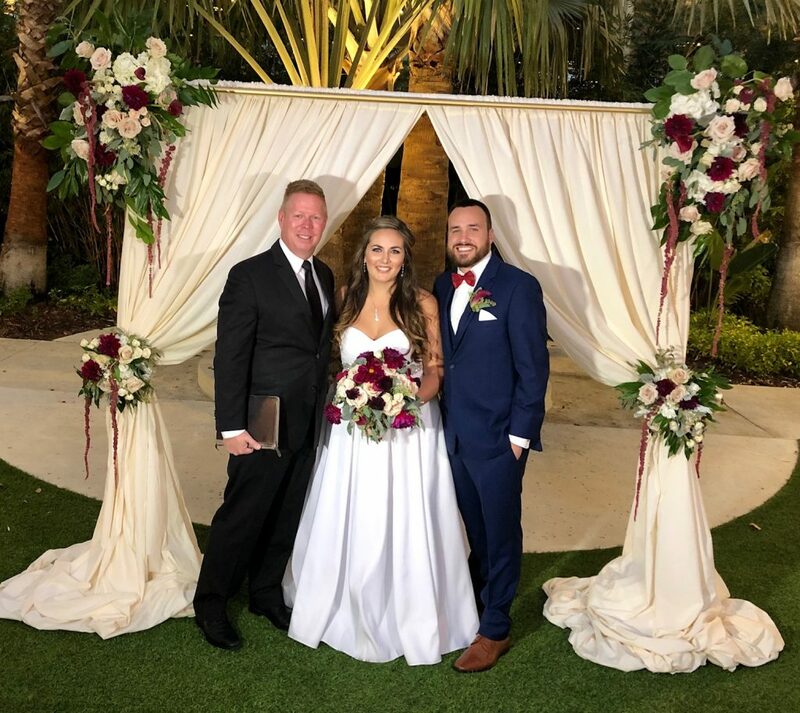 Glynn Ferguson with the Orlando Team of Sensational Ceremonies worked with the couple to create a one of a kind, custom ceremony. They wanted a contemporary ceremony that spoke of their love for one another with personalized touches. Rev.Glynn gave them a “homework assignment” to write and say why they love each other. and Daniel wrote: I love you for always supporting me and being there for me no matter what. For bringing me from the lowest part of my life to the highest. For allowing me to be myself and accepting me at my weirdest. You make me the happiest when I am with you, and whenever I am away from you, I can’t wait to see you again. I can be upset or frustrated with something and as soon as I am with you, I forget about everything else and just get lost in the love and happiness I have with you. I love you for how perfect we are and everything we have in common. For being as silly as I am and pulling pranks on each other. For being able to hang with my sports addiction and to experience those moments with you. I love you for being my best friend and I never want to experience any part of life without you. I love you for being able to talk to you about anything. I love you for loving me the way you do and showing me what love really is. I love you for being who you are. The most beautiful, sweetest, happiest, loving, courteous, giving, welcoming, caring, strong, most amazing woman I have ever met in my entire life. I love you for being my reason. I love you for being my everything. I love you for always making me smile and laugh. Congratulations to Daniel and Jessica. We wish you a lifetime of happiness together.